Elegantly serve your guests with this Cambro WW250CW CamView Camliter 8.5 oz. 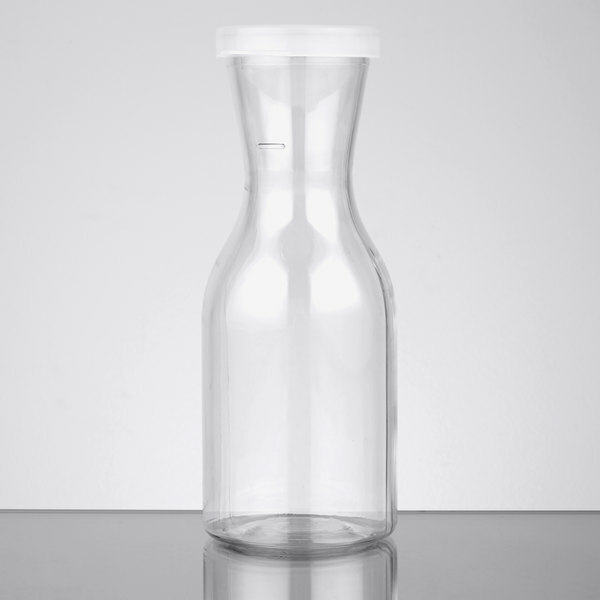 plastic beverage decanter with lid. 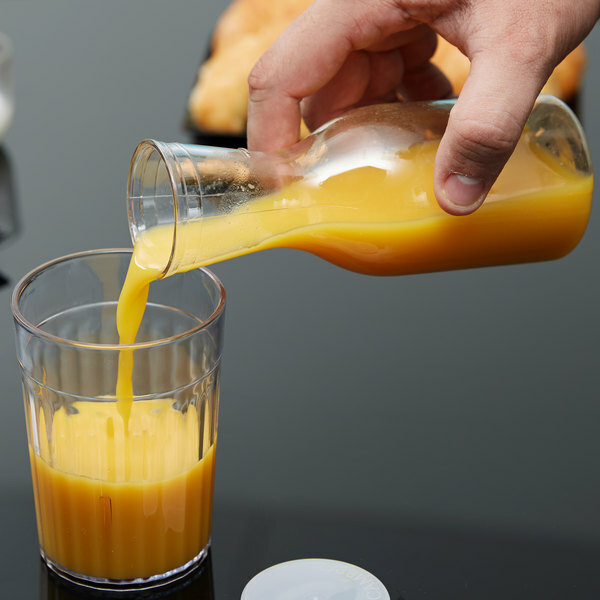 "These are super lightweight and perfect for serving freshly squeezed orange juice in! We use these for serving water! 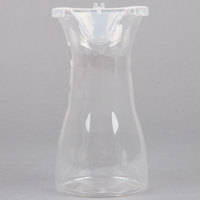 Customers like these pitchers instead of the cheap plastic ones!!" 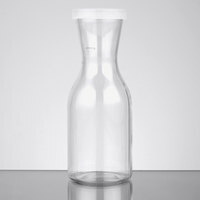 Made of durable Tritan plastic, this decanter is scratch resistant for long-lasting use. While its 8.5 oz. capacity allows guests to top off their glasses without waiting for tableside service, its sturdy construction makes it perfect for outdoor catered events where glass breakage is a concern. 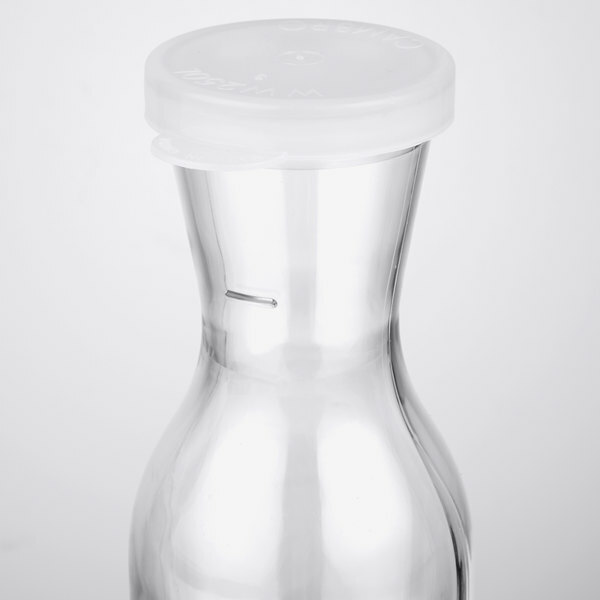 Upgrade your beverage service with this CamView Camliter decanter! We use this for salsa. It's the perfect size for it. My customers commented on how amazing these are. One asked me where I got it from. 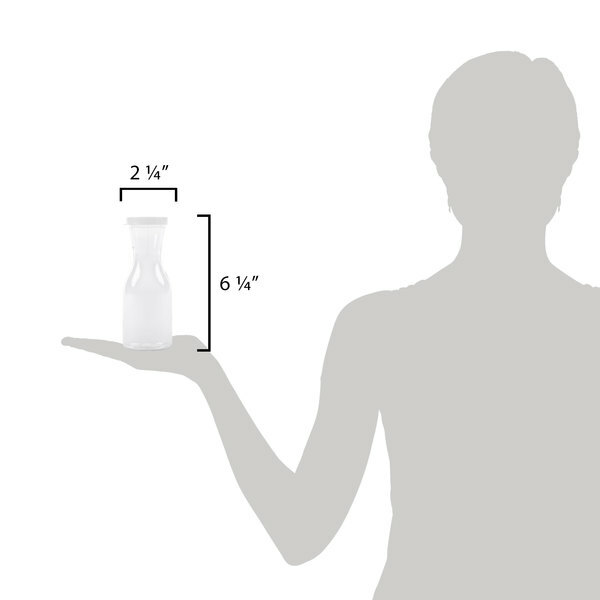 We prefer to put beverages in decanters instead of leaving them in there original packaging. 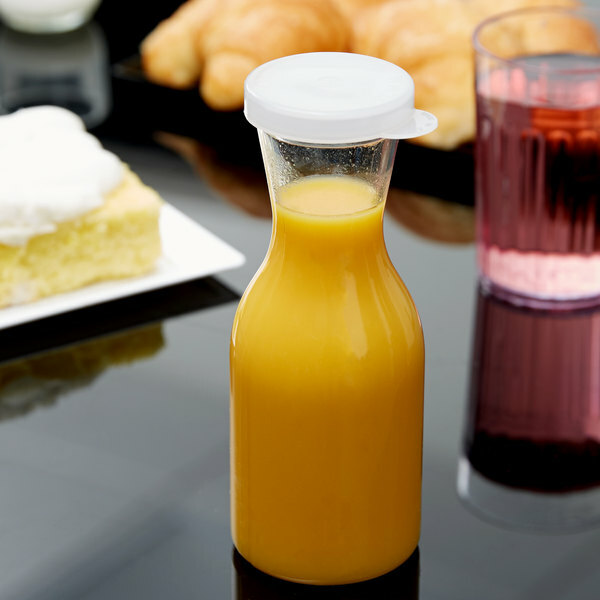 This plastic beverage decanter is great for brunches and lunches. We have used it for orange juice, mimosas, as well as milk. 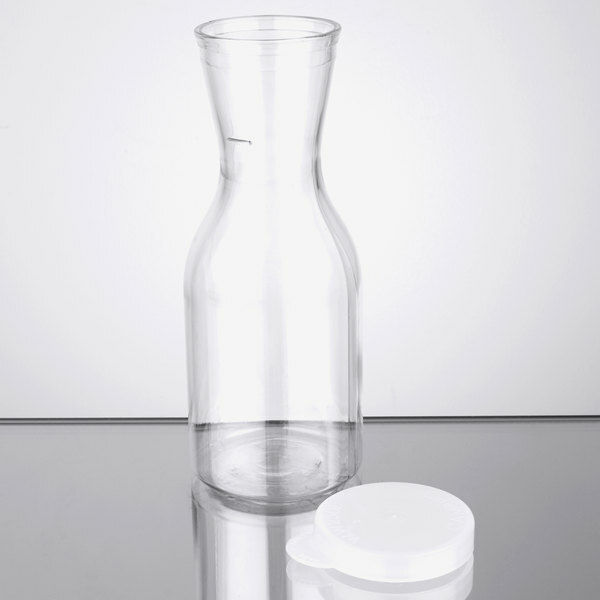 The decanter comes with a lid to keep the contents fresh and uncontaminated. GREAT ITEM HAVE USED THESE FOR QUITE SOMETIME. GREAT FOR USING WITH SALSA OR OTHER LIQUIDS NEEDED. WILL USE THIS ITEM AGAIN! DURABLE MACHINE WASHABLE! The Cambro WW250135 CamView Camliter .25 Liter Tritan Plastic Beverage Decanter with Lid is perfect for lemonade, milk and orange juice. The quality is good as well as the price. Highly recommend! This decanter is a bit flimsier than I was expecting, but it still does the job. I've mostly used mine for storing different types of juices. I wanted to love these, but wasn't thrilled. Very hard to wash, lightweight, and the lid didn't feel securely fastened even when it was. For table use I'd choose something heavier, and for kitchen use I'd choose something with an easier lid. Nice quality item. Excellent price. Immediate shipping. We use every day, 3 times a day (at every meal). Holds up to our abuse and looks great. Thank you! We use these for self service nuts and raisins on our morning hot bar. They keep the product neat, and allow the chunky products to flow out nicely. We use these for serving salsa to our customers. They work great and are the perfect size for serving at the table. The lids are not so great for heavy use. Perfect little size. I love the fact that it comes with a lid. It can be used for many things but we use it for wine. I love these little carafes for all sorts of reasons. 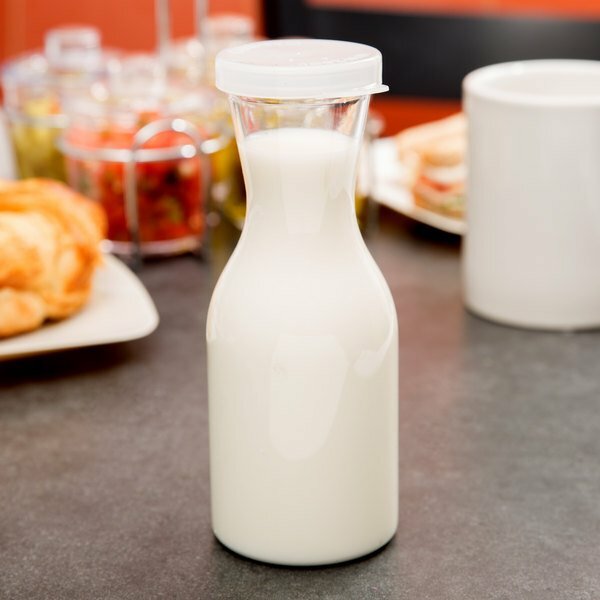 Whether it's pancake syrup or salad dressing, they are a great choice for serving liquids to the dining table. These are super lightweight and perfect for serving freshly squeezed orange juice in! We use these for serving water! Customers like these pitchers instead of the cheap plastic ones! !